Peter Cullen, voice of Optimus Prime, recently lent his legendary voice to a slick animated introduction to the successor of the ridiculously prolific Hubble Telescope, NASA's James Webb Space Telescope. But Cullen's velvety voice is far from the only reason to be excited about JWST. Above: Six of JWST's beryllium mirror segments undergo a series of cryogenic tests at NASA's Marshall Space Flight Center. Via Wikimedia Commons. There isn't a field in all of astrophysics that will not benefit tremendously. Just as Hubble was… not just a leap, but an enormous leap forward for all of astrophysics, including the discovery of Dark Energy (70% of… the energy of the Universe was unknown before Hubble), I find it almost impossible to believe that we won't make the same kinds of discoveries with the James Webb Telescope. Once [we] started seeing things with Hubble that [we'd] never seen before, [we] pushed it harder and harder to do new things. 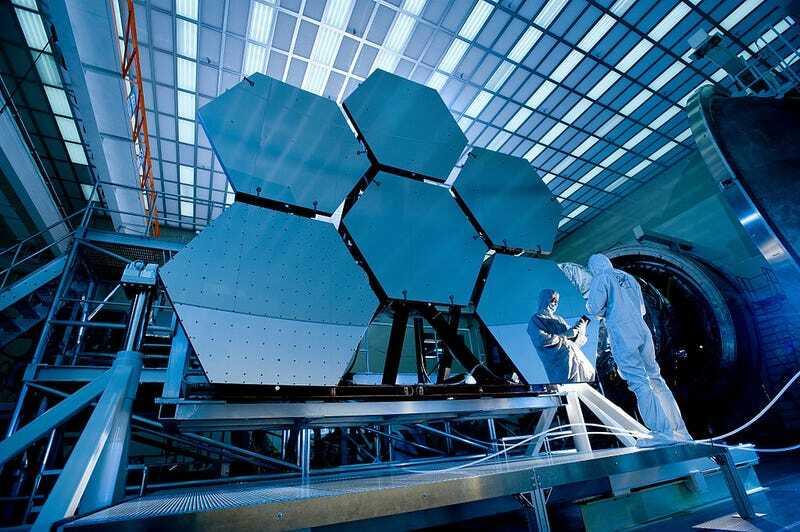 The same will happen with the James Webb Space Telescope. We will discover new things that we have no way of knowing about today, no way of guessing [because] our intuition isn't able to take us there. And those will be the great discoveries that actually show up in the coming 20 years, in the coming 30 years. It is really, in many ways, the golden age of astronomy — it's the very best time ever to be an astronomer. If that doesn't send chills up your spine, I don't know what will.